So, I get to spend a lot of time thinking these days. While nursing Penelope quietly in the rocking chair in our bedroom, since she's too distractible to nurse around the rest of the family or in front of the computer or TV. While trying to fall asleep, knowing that she's going to wake up for her first nightly feeding right after I conk out. While walking home from taking Isobel to school in the morning or walking to pick her up in the afternoon. Anyway, there is a fair bit of time in my life these days where I can't have knitting needles (or graph paper and pencil) in my hands, so I get to think. And I've been thinking about some knits I've only seen in my head. At some point I'll have to turn these theories into practice. Anyway, I've been thinking a lot about waist-shaping* and just rediscovered Knitting Daily's Waist Shaping Calculator. *And cables, and in-the-round construction, and various seamless yoke options (EZ offers some interesting variations), and if my theories work, you will hear all about them! 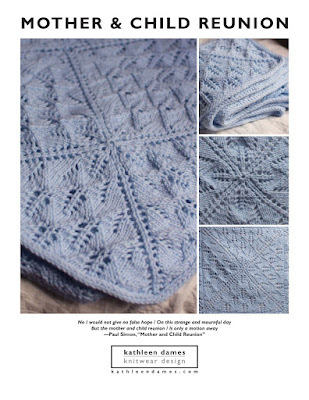 Interweave Knits and Knitting Daily are offering the Soap Bubble Wrap as a free download. It is a very cute sweater (I seem to be drawn to wrap sweaters lately for Spring/Summer), and the model has an adorable tuchus in the photos. The recommended yarn is Euroflax Worsted, though worsted cotton and cotton blends are also suggested. Having just received my copy of IK yesterday, I've already dog-eared this pattern. Mods: None! This is a great pattern. These are a belated Christmas present for my grandmother, who loved the slippers I knit her for Mother's Day. As she told me about those slippers: They never even made it into the drawer. I imagine these won't either, as they'll keep her feet and ankles warm. Added bonus: They're machine washable. I made a pair of these for myself ages ago and liked them for padding around before bed. No idea what happened to them. Guess I need to make a pair for myself.